A few weeks ago I wrote about indigo dye and how it transforms, through a seemingly “magical”process, from its colourless compound into its deep blue compound, upon exposure to air. The only other dye to undergo a similar “magical” process is shellfish purple! 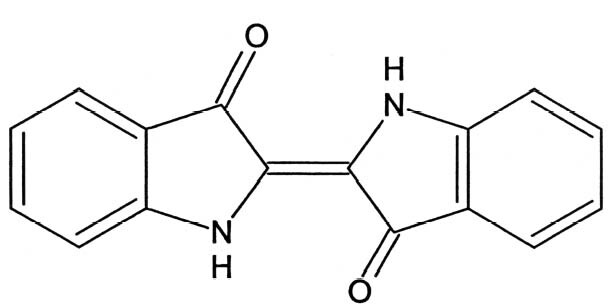 Chemical structure of 6,6′ dibromoindigo determined by Paul Friedländer in 1909. This is the major component that gives rise to Tyrian purple, also known as Royal purple, shellfish purple and Purple of the Ancients. Chemically very similar to indigo – the addition of two bromine atoms gives rise to the colour difference. Taken from the gland of molluscs in the murex family, Tyrian purple is arguably the most famous dye: signifying power and wealth on account of the costliness (nearly 10,000 molluscs were needed to make a gram of dye) and its eye-catching beauty. During antiquity the production of Tyrian purple flourished along the Mediterranean coast with the cities of Tyre (giving rise to the name Tyrian purple) and Sidon being closely connected to and owing most of their economic power to this enterprise. The scale of this industry is still evident in the thick, shell covered beaches surrounding Tyre and Sidon. 11th century Byzantine robe, dyed Tyrian purple or royal purple with murex dye. Several ancient texts and people (including the Old and New Testaments, Vitruvius, Aristotle’s History of Animals, and Pliny the Elder) make reference to shellfish purple. However, I do want to point out that although they all refer to the colour as “purple” it may be different to what you and I know as “purple”. The colour ranged from what we now consider red through to blue. Pliny noted the dye from the northern Mediterranean murex produced a different dye to that from the south, so location had very much to do with the dyestuff and the “purple” hue generated. 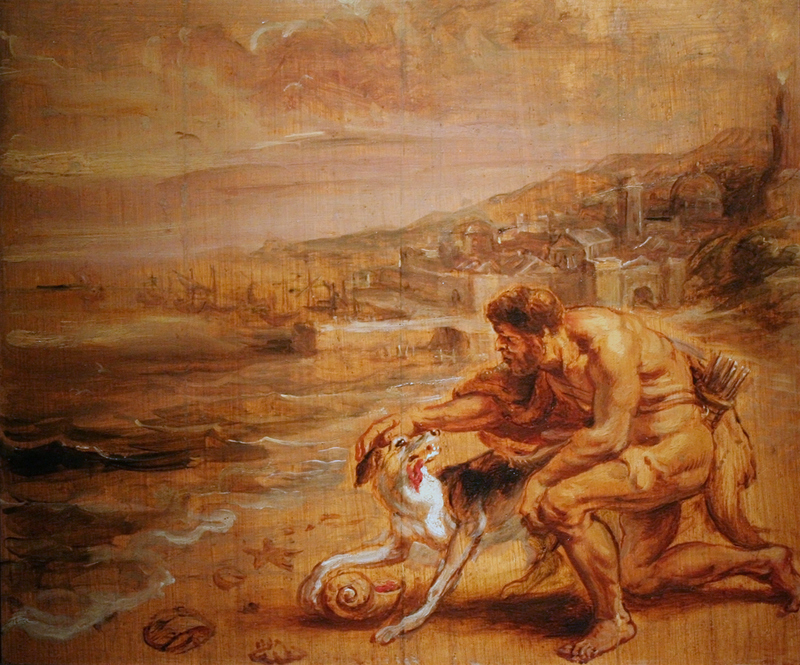 With the prestige surrounding this dyestuff, there are also a number of myths as to its discovery, including the well-known Greek legend that Hercules (or more rightly his dog) discovered the dyestuff after biting into a mollusc during a walk along the beach. However, with what we now know about this dyeing industry this myth has been debunked! Also with the earliest archeological evidence (roughly 1900 B.C) showing up in Crete it seems shellfish purple had been discovered and exploited by the Minoan civilization. The fall of the Roman Empire was the beginning of the end of Tyrian purple and by the time the Turks conquered Constantinople, in 1453, bringing down the Byzantine Empire, the production and knowledge of this lustrous dye ended. 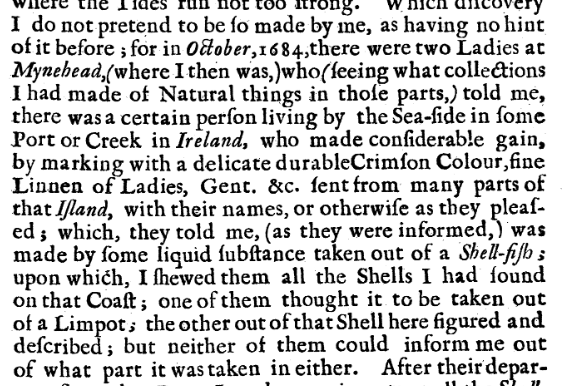 While the story of purple in antiquity is fascinating, something else has piqued my interest…the much less told story of shellfish purple in other parts of the world, particularly Britain. Over 200 years after the demise of the Mediterranean shellfish dye industry, English naturalist, William Cole rediscovered the beauty of the mollusc dye (albeit a different mollusc to the one used in antiquity). His letter describing his observations on the Purple Fish were published in the Philosophical Transactions. Below is an extract from this letter where he describes his chance meeting that led to his discovery. Cole goes on to describe the sun-sensitive, chemical reaction that takes place, changing the colour of the dyestuff from a “light green” through various shades of green and blue until the final “deep Purple red”. This process exactly corresponded to those seen by Pliny. Although Cole didn’t know of such a dye until 1684, Nucella Lapillus can be found on the shores of Britain and Ireland and seems to have been involved in its very own long-standing purple dye industry (just little was known or written about it). “There is also a great abundance of snails, of which the scarlet dye is made, a most beautiful red, which never fades with the heat of the sun or exposure to rain, but the older it is, the more beautiful it becomes.” St. Venerabilis Bede [Translated from Ecclesiastical History of the English People, thought to have been completed in 731]. Further research from Cole led him to believe domesticated molluscs were used in old Britain and Ireland the same way Tyrian purple was used by the ancients. 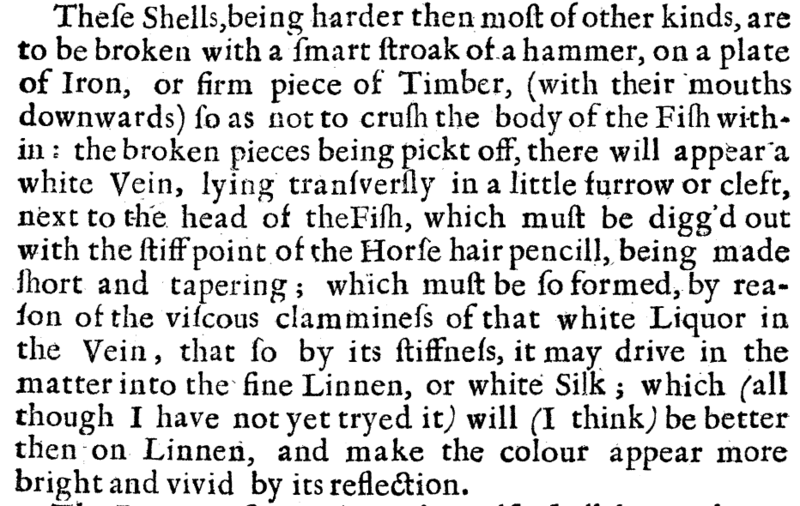 This seems to have been further confirmed (at least for Ireland) with the archeological excavation of a dog-whelk dyeing workshop on the island of Inishkea North, Co. Mayo. The structure, roughly 7.3m in diameter and found with a pile of broken-open dog-whelk shells next to it, was dated to the 7th century AD. Delamare, Francois and Guineau, Bernard. (2002) Colour Making and Using Dyes and Pigments. Thames & Hudson Ltd.
Kay-Williams, Susan. (2013) The Story of Colour in Textiles. Bloomsbury Publishing Plc. Sandberg, Gosta. (1994)) The Red Dyes: Cochineal, Madder, and Murex Purple. Lark Books. Thanks for this post! I wanted to know why it was called purple when it didn’t seem purple from the outside, so I googled and found your blog. This creature is called “purple-something-or-other” in a number of languages, including Faroese (“purpurkúvingur”). Since the Faroes and UK are so close together, I think that kind of thing adds even more credibility to the idea of UK-based dyeing operations. Also, “red-blue” is a pure synonym for purple in the languages I know, same as stuff like “fire-yellow” is a synonym for orange, and most “blue”s seem to really mean “sea-color: blue-green”. Our word for yellow came from the word for gold and even today, Nordic people frequently say gold when they mean yellow or orange (ex. orange-colored pasta = gold pasta). And I mean, purple IS a mix of red and blue. So for me anyway, that bit isn’t surprising.